Red cloth is faded to spine on volumes 1, 2 and 3. Only volume 4 has its dust wrapper which is a little faded. Occasional light mark to cloth but generally neat. Hardback. The letters of novelist Arnold Bennett. 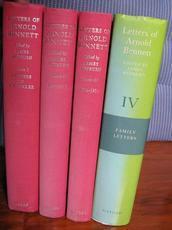 Volume 1 Letters to J.B. Pinker, xxiii, 427pp; Volumes 2 Letters 1889-1915, xix, 387, Volume 3 Letters 1916-1931 xvi, 368pp; Volume 4 Family Letters, xxxviii, 638pp. and with letters in French translated by Rosamond Howe. Black and white frontis. to the first three volumes and occasional further plates. Editorial material includes chronologies and contextualising essays. Letters all with footnotes. Indices to all four volumes.